It’s a law of the universe: Creativity always starts at the edge. Humans are social creatures. We’re tempered to follow the crowd; we’re tempted to flock to the main stage; and we’re tempted to do what everybody else is doing. "It happens around the edges: At any gathering of people, from a high school assembly to the General Assembly at the UN, from a conference to a rehearsal at the orchestra, the really interesting conversations and actions almost always happen around the edges. If you could eavesdrop on the homecoming queen or the sitting prime minister, you'd hear very little of value. These folks think they have too much to lose to do something that feels risky, and everything that's interesting is risky. Seth knows Where the Wild Things Are. In New York, culture runs along the L-Line. Culture begins in Bushwick, where rents are low, the parties are wild, and the streets are covered in graffiti. Bushwick is crazy and unpredictable. Last time, I was in Bushwick, I walked by people dressed like Tigers, watched a woman pull her boyfriend on a leash, and met a man dressed in a tie-dye purple Grateful Dead shirt who insisted he’d drank 50 beers the night before. Over time, creative ideas trickle towards Manhattan. Williamsburg takes the best of Bushwick and profit from it. Rents are high, hotels are fancy, and the fashion is eclectic. Williamsburg is corporate, yet artistic. It has one foot in the creative pool of Bushwick and another in the capitalist jungle of Manhattan. Streets are lined with corporate graffiti, Etsy-style vendors, and overpriced artisanal restaurants. Williamsburg is a case study in gentrification. In Chelsea, the gentrification ended a long time ago. There, you’ll find multi-billion dollar corporations such as Google and MLB Productions. Next door, you’ll find the Whitney Museum, which provides "the most expansive view ever of its unsurpassed collection of modern and contemporary American art” according to its website. From media, to technology, to the visual arts, cultural icons have laid their roots in Chelsea. From Chelsea, information flows directly to newspapers like the New York Times and TV networks like CNN, who shape thought and culture. The L-Line lineage — from Bushwick to Williamsburg to Chelsea to the World-At-Large — begins in the dark backrooms of closed-down warehouses and ends in the bright lobbies of thriving, multinational institutions. "Drums were key to the sonic universe of Latin music and then, the Bronx. Black culture meets Latin culture. The major music labels are in the heart of Manhattan, right on the 4-5-6. Sony Music Entertainment is right off the 23rd Street stop, and Atlantic and Universal are within walking distance of the 53rd street stop. Whether it’s Bushwick or the Bronx, creative ideas trace the subway tracks and make their way to the heart of Manhattan. What does New York culture reveal about the world-at-large? The L (grey) line runs East and West. 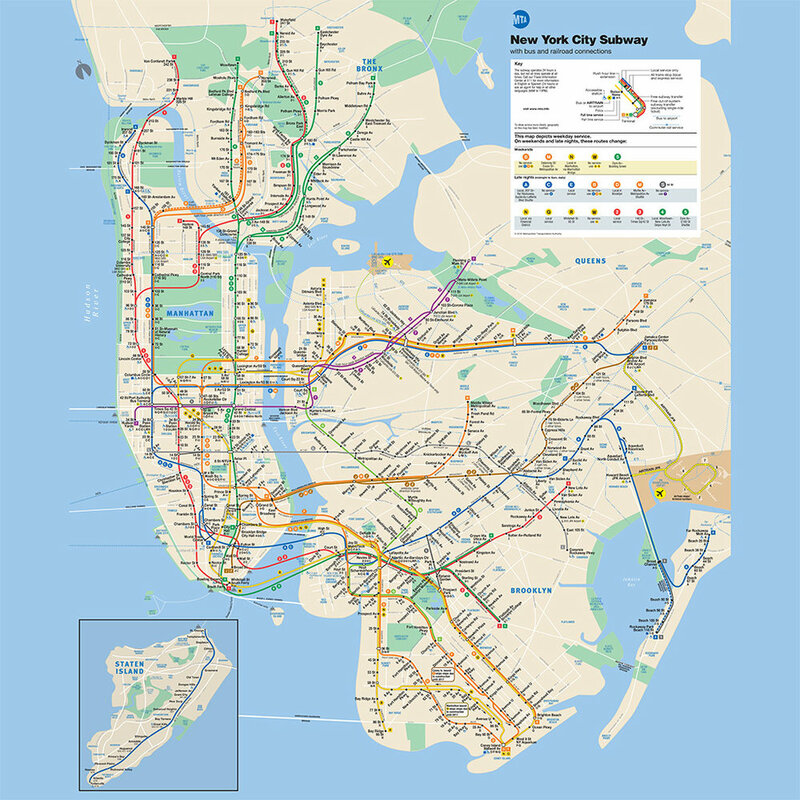 The 4-5-6 (green) line runs North and South on the East side of Manhattan, the island on the left. Lessons from Bushwick and the Bronx reveal general truths about the modern world. We live in the information age. We are knowledge hunters, gatherers, and consumers. We manage daily trade-offs between new and old, fresh and trusted, and exclusivity and dependability. Diggers hold the key to Pandora’s Box. They live in Bushwick and the Bronx. They inhabit the unknown and thrive in the vortex of randomness. Like a gold rush at the edge of the frontier, the vast majority of Diggers don’t strike it rich. Diggers operate under their own intellectual gravity, where up is down and down is up. At their best, they’re innovative and creative. At their worst, they’re manipulative and destructive. Tourists arbitrage thought and culture. They borrow fringe ideas, clean them up, and bring them to mainstream consciousness.² Tourists need structure. On one hand, they’re pulled by the pursuit of success and the weight of responsibility. On the other, they’re spurred by the quest to invent and the yearning to explore. The Masses operate within clearly-defined, well-mapped territories. They march to the beat of the establishment and operate within traditionally defined hierarchies. The Masses treasure safety and predictability. Guided by tradition, consensus, and social proof, the Masses chase reach and scale. Climb to the top of the Masses, and you’ll have more influence than Alexander the Great. You’ll schmooze with journalists, dine at Michelin Star restaurants, and invite your favorite celebrities over for high-stakes poker on Friday nights. Informational advantages are found in obscure, hard-to-digest sources. As information moves from the boards of 4chan to the forums of Reddit to the front page of the New York Times, the signal to noise ratio increases and informational advantages disappear. As ideas trickle from the fringe to the mainstream, their tone, tenor, and shape transform. Diggers thrive in exclusive group chats on Telegram, weird Reddit threads, and the nooks and crannies of Twitter-based subcultures. In their search for secrets and undiscovered truths, Diggers confront conspiracy theories, incomprehensible rants, and shirtless commenters who yell at the world in nothing but their underwear. Even in my podcast interviews, conversations take a turn-for-the-interesting once the microphone turns off. On the internet, information slowly travels from hidden forums and private conversations to Tourist-friendly channels. Tourists operate in well-mapped areas that aren’t mainstream, such as Medium and podcasts. They trade surprise for predictability. Tourists experience small tastes of the frontier. Nevertheless, like turtles under a shell, they treasure their safety. One thing is clear: The higher you climb, the bigger the stage; the bigger the stage, the less you can mess around on the edges — Where the Wild Things Are. The color of ideas change as they move from filter-to-filter. As information gets polished, it becomes easier to understand; as it becomes easier to understand, it reaches the masses; and as it reaches the masses, once-fringe ideas become common knowledge. Over time, ideas become tainted by corporate interests and political agendas. Shared narratives emerge and informational advantages disappear. Opportunity is almost always inversely correlated with popularity. Likewise, greater risk is almost always correlated with greater potential returns. Find the low rents. Surround yourself with people who dress like people you only see in movies. Get comfortable with weird parts of the internet. If you want creativity, stay at the edge. Follow the Diggers — they know Where The Wild Things Are. ¹ This quote was in my notes but I have no idea where it’s from. “I think that a lot of people talk about contrarianism as being against the grain, and having views that other people disagree with. Of course, the challenge is the decision of, ‘I have this view that people disagree with. Similarly… it’s hard to judge the people around you because it could be that you have a view that is mainstream in your community, but it’s actually a contrarian view in the larger view of people. My view of contrarianism is that the important part isn’t in having this view that everybody else disagrees with. The important part is bringing it to everyone else, taking that view and causing it to become non-contrarian.